The Asia Pacific market for single-use bioprocessing systems is expected to witness a high level of competition throughout the forecast period, states a new research study by Transparency Market Research. The increasing number of players operating in the Asia Pacific market is one of the key factor strengthening the competitive environment of the market. The leading players in the market are focusing on the development of new products in order to enhance their market position in the next few years. Some of the leading players in the market are Sartorius AG, Merck KGaA, Thermo Fisher Scientific, GE Healthcare, Saint Gobain, Danaher Corp., Corning, Inc., and Parker Hannifin Corp. In addition, the increasing number of mergers and acquisitions and strategic collaborations are projected to generate promising growth opportunities for the key players in the Asia Pacific single-use bioprocessing systems market. 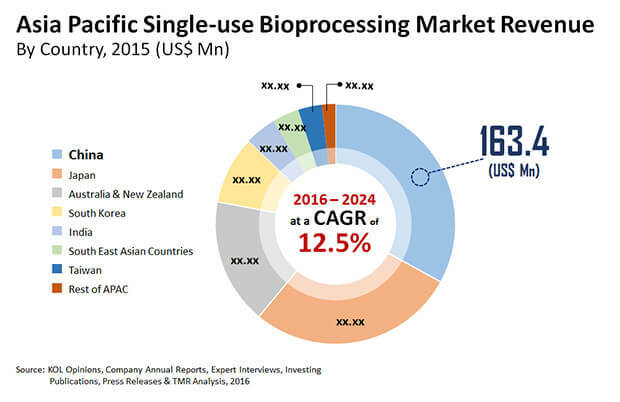 According to the research study by Transparency Market Research, in 2015, the Asia Pacific single-use bioprocessing systems market was worth US$0.4 bn and is likely to reach a value of US$1.4 bn by the end of 2024. The market is estimated to register a progressive 12.50% CAGR between 2016 and 2024. From a geographical perspective, China is expected to lead the Asia Pacific single-use bioprocessing systems market throughout the forecast period. As per the research study, this segment is likely to remain in the leading position in the coming years and is likely to account for a large share in the market. Furthermore, Japan is expected to witness high growth, thanks to the rising demand for prefabricated and for cost effective modular bioprocessing facilities. In addition, the launch of new products and the development of the pharmaceutical industry are projected to accelerate the growth of the single-use bioprocessing systems market in Japan throughout the forecast period. The rising number of applications of single-use bioprocessing systems and the reduced time consumed by sterilize in place and clean in place are some of the major factors that are expected to encourage the growth of the overall market throughout the forecast period. On the other hand, the lack of awareness regarding innovative disposable products and technical difficulties are projected to restrict the growth of the market in the near future. Nonetheless, the requirement of low capital investment and cost effectiveness are likely to offer promising growth opportunities in the coming years. Requirement of low capital investment to encourage the growth of the Asia Pacific single-use bioprocessing systems market. China market for single-use bioprocessing systems market to witness high growth in the next few years.